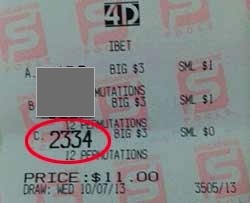 We received a winning ticket from one very happy member when he won ibet from our special forecast number. This special forecast number is highlighted in RED, that is why he buy this on that day. If you are the Gold member, you will be able to see this special forecast number when you log in.